Business outcome studies are one of the best, if not the best, ways to translate the efficiencies gained from talent management processes into actual profits for a company. PreVisor, the global leader in employment assessments and talent measurement solutions that connect employment decisions to business results, released its 4th annual report today summarizing 37 business outcomes studies. Each study is completed in collaboration with clients to demonstrate the proven impact of employment testing for hiring or placement. The 2010 Business Outcomes Study Report includes findings from studies done with client organizations both in the U.S. and globally. These studies represent a wide range of industries, including financial and business services, healthcare, hospitality, retail, and telecommunications; and focus on a multitude of job types – hourly, professional, managerial, sales, and customer service. Advance Auto Parts, CenturyLink, Luxottica, MetLife, Sprint, Time Warner Cable, and Xerox are among the more than 130 organizations who have participated in business outcome studies since 2007. The 2010 report includes a future trends section which outlines the following new and emerging talent measurement solutions: In response to economic events in 2009, a large majority of companies have placed an increased focus on the quality of hire metric. Secondly, employment testing is moving beyond pre-hire screening and talent acquisition – into current employee base assessment for placement and development. Another trend to note is the increased use of “whole-person assessments”, which employ a variety of different assessment methods to target job candidate characteristics most relevant to business outcomes. Trend number four shows that small to mid-size businesses are looking for self-service platforms that provide a cost effective means for them to compete for talent with large organizations. Lastly, assessments are increasingly sophisticated – utilizing technology resources like computer adaptive testing (CAT), online multi-media simulations, and job/culture specific tests. In conclusion, the report focuses on where talent measurement is headed, describing more specifics of innovation through technology. 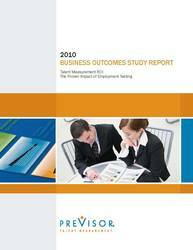 Request a copy of the 2010 Business Outcomes Study Report.